Posted on Thursday, September 2nd, 2010 at 6:00 am. Subscribe to the comments feed. Both comments and pings are currently closed. Post on your own blog. Great question Pete. My initial reaction is that it’s a snippet from Google. I’m not sure how Apple was showing up previously in the SERPs but I’ve had a few clients that have snippets replace short titles like “apple”. 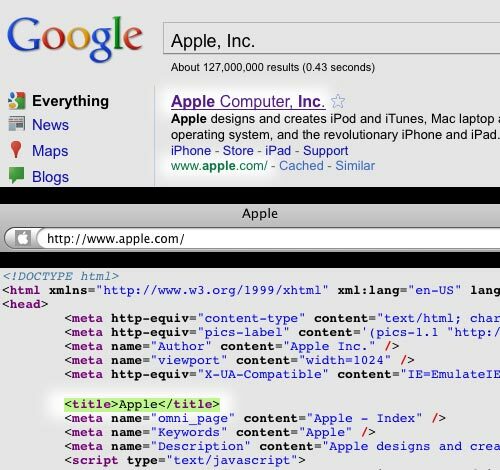 The odd thing is that typically snippets are generated by text contained in , , or tags and I couldn’t find “Apple Computer, Inc” anywhere in the code. They just had a huge algo update that places more emphasis on big brands, maybe this is a residual effect?